Gibo/Kodama Chairs have made great strides toward furnishing the cleanroom industry with durable, ergonomic, aesthetically pleasing and, most importantly, "Cleanroom" seating. Through these efforts we have developed our Class 100+ Cleanroom Chair in the 3000 series and a new Class 10 Cleanroom Air exchange Chair. Cleanroom chairs are tested by an independent testing laboratory with data available upon request. 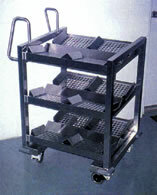 ErgoTilt or BackTilt Control and specified casters or glides. Depth filtration ventilation for seat and back. 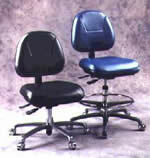 The ACE8030 and ACE8040 Series Chairs use a seat and back cushion which has been sealed into a heavy bladder. Pressure from a persons weight causes air to be transfered through the seat and back into another sealed bladder. No foam is exposed to the cleanroom atmosphere and no air storm is created by the escape of air through filters. 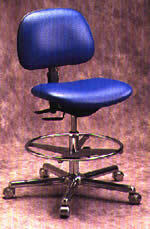 The ACE 8030 chair has a seat size of 18-1/2"x 17" while the ACE 8040 series has a seat size of 22"x19". These specially designed cabinets provide the sheltered space necessary for storing tools and instruments, clean parts, cleanroom garments, process materials, wipes, gloves, glassware or any other materials normally used in your Cleanroom environment. 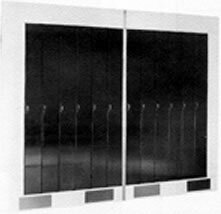 Provides for continuous bathing of Cleanroom garments and equipment with HEPA filtered air and will upgrade any model Economy Storage Cabinets to Class 10 per Federal Standard 209B. Absolute (HEPA) filter system, 99.97% or 99.99% (optional) efficient on 0.3 micron size particles. A quiet,self-contained blower system to provide 350 CPM output from the HEPA filter system easily accessible from the front of the cabinet. Disposable polyester pre-filter easily accessible from the front of the cabinet. Adjustable shelf models will be fitted with stainless steel perforated shelves to permit a constant laminar flow. Heavy Duty Tables are suitable for Class 10-10,000 cleanroom applications and are recommended for supporting table top laminar flow stations or other heavy equipment. Each leg is fitted with leg levelers and the rigid leg structure resists deflection under unbalanced loads. All welded heavy-wall tubing is used in the construction and allows the bench top to support much heavier loads without sagging over conventional benches. Standard work surface height is 34". Solid Laminate Top With Steel Frame. Work surface is white laminate top and sides with sealed bottom. High density 1-1/8" thick core. Legs and frame are 11 gauge (1-1/2") steel tubing finished with white epoxy enamel. 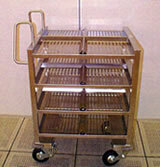 Solid Stainless Steel Top with Painted Steel Frame. 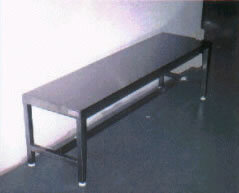 Stainless steel tables combine durability, chemical-resistance, cleanliness, and conductivity. The 18 ga. 2B (or optional #4 mill brushed) finish stainless steel top has a solid high density 3/4" thick core and is mounted on either a white epoxy-finished 1-1/2" steel frame or 1-5/8" stainless steel frame. 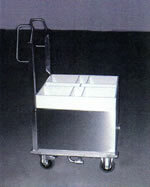 All Stainless Steel Construction - Solid Top. Work surface is 18 ga. 2B (or optional #4 mill brushed) finish 304 stainless steel. Legs and frame are 1-5/8" stainless steel tubing consisting of all welded construction. All tables are shipped fully assembled and ready to use. Heavy-duty solid bench provides a sturdy and comfortable gowning fixture. Top is manufacture from 14-gauge, Type 304 stainless steel. Stainless steel footplates provide floor mount or freestanding option. Standard Lengths; 48", 60", 72", 84", 96"